One of my favorite parts of being in a quilt guild (or two!) is attending quilt retreats. The first weekend in November I spend the weekend in the Marin Headlands with SCVQA. It has a spacious sewing space, the food is delicious, and the views are amazing! 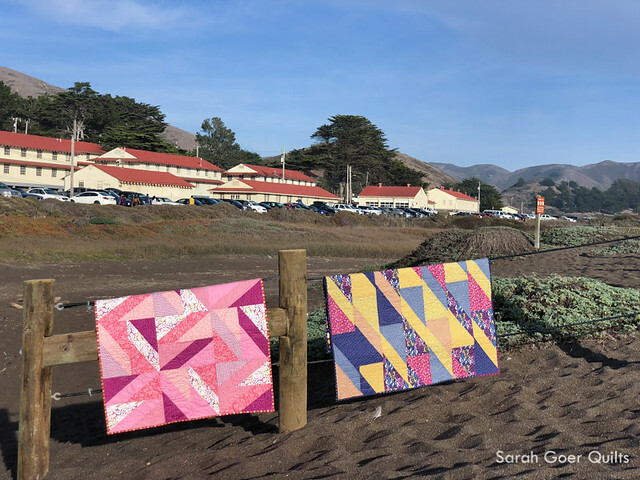 The majority of projects that I brought for the weekend were pieces that I wanted to finish in time to share at my Nov. 10 lecture at Amador Valley Quilters. Two of these were finished at the retreat. (The other two I made great progress on and will be sharing them on the blog soon!) I shared my Wonder Full quilt tops back in June. They use my Planned Improv: All About Angles technique in a more regular unit construction. I really like how I took two piles of identically constructed units and made two quilts with such different overall compositions. 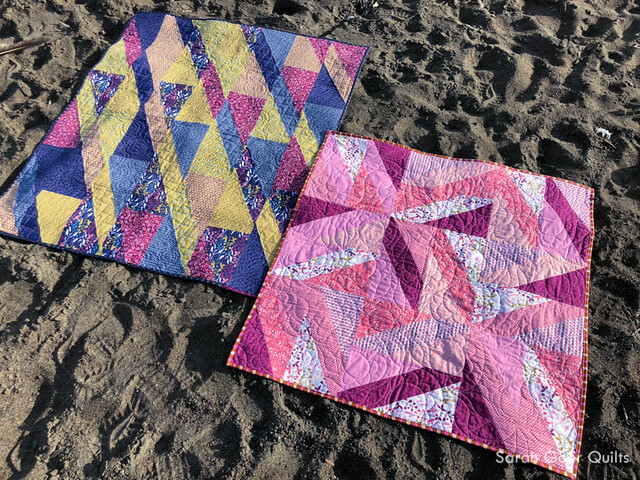 These two were the first and third quilts I longarm quilted myself. 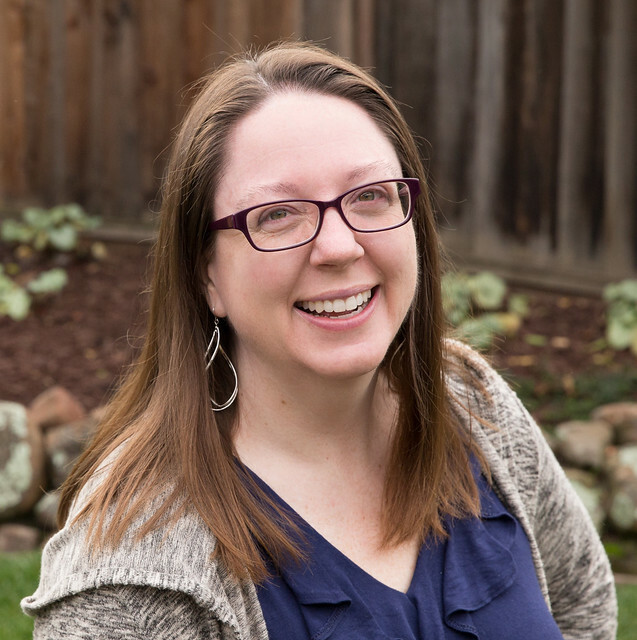 I've been renting time at Always Quilting in San Mateo for free hand longarm quilting. 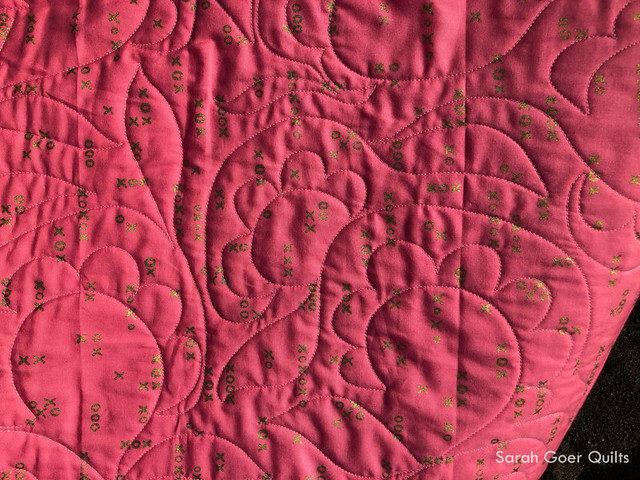 The pink quilt was my very first one. I opted for a floral and leaf design with large scale motifs and lots of space. On my second trip to the longarm I quilted the navy quilt. I opted for three different motifs and alternated the designs in each diagonal strip. This led to a challenge as I couldn't complete a strip without advancing the quilt on the frame which resulted in numerous starts and stops. That said, I'm thrilled with the overall look of the quilting. Check out that texture on the back! Between this one and Fandangle Scrappy Squares I am now hooked on the longarm. All About Angles is my latest Planned Improv workshop. I'm currently working on a mostly blue version with Cherrywood fabrics, using smaller units. And you may have seen my Pantone Ultra Violet version which I finished this summer. 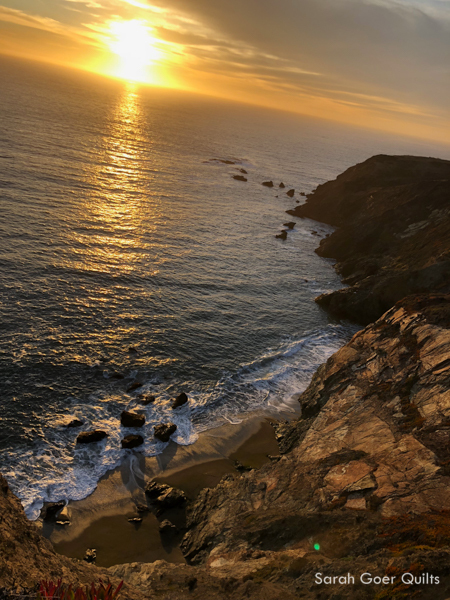 The second night of our retreat I took advantage of the opportunity to go on a short hike with a few other quilters to watch the sunset. The weather was perfect. Thanks for visiting! Happy quilting! Posted in Quilting. 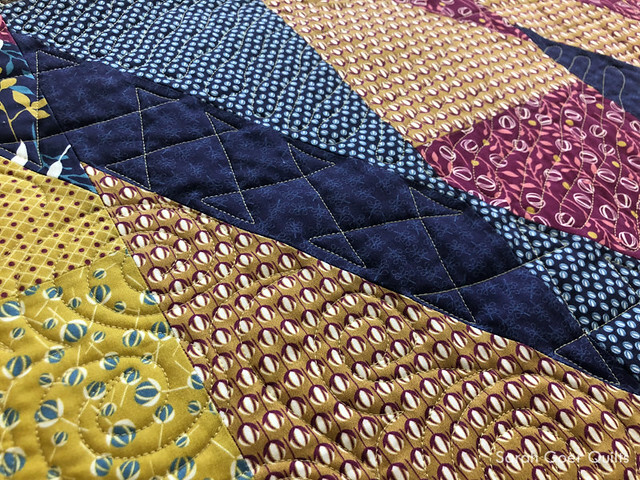 Tags: all about, baby quilt, finished quilt, lap quilt, planned improv, Wonder Full fabric on November 13, 2018 by sarah. Both finishes look great! 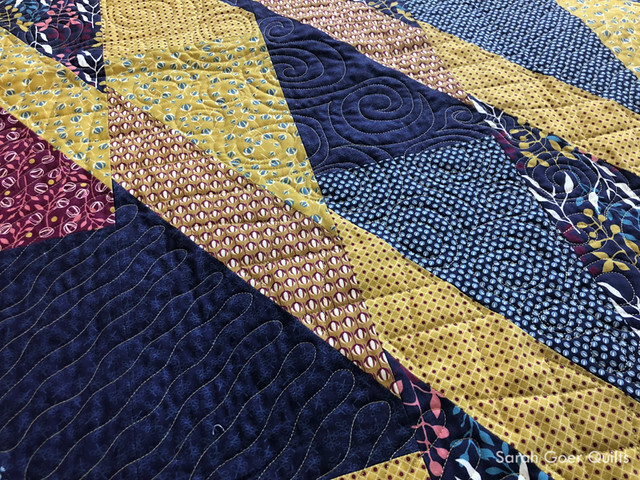 Beautiful work with the longarm on the quilting. Thank you, Cheryl. They were so fun to quilt! Thanks! The weather was so lovely! The acrylic board technique is a great one. The benefit of free motion quilting a bunch is building an bit of intuition about the path one could take. And the free motion skill from working on a domestic transfers (at least somewhat). ;-) I still sometimes "paint" myself into a corner, but overall I just work in a general direction across an area. Thank you for visiting, and for the thoughtful comments, Roseanne. It sounds like you had a great retreat. Your quilting looks great. Beautiful finishes, Sarah! I'm about to get certified to use the longarm at my LQS. I'm excited at the opportunities it will open up to me! You're going to have so much fun!!! Thanks for visiting, Michelle. Thanks for visiting, Teresa. Are you wanting to use Breakers and Chartreuse in the same quilt, or for two different projects? Great finishes, I love the improv technique. 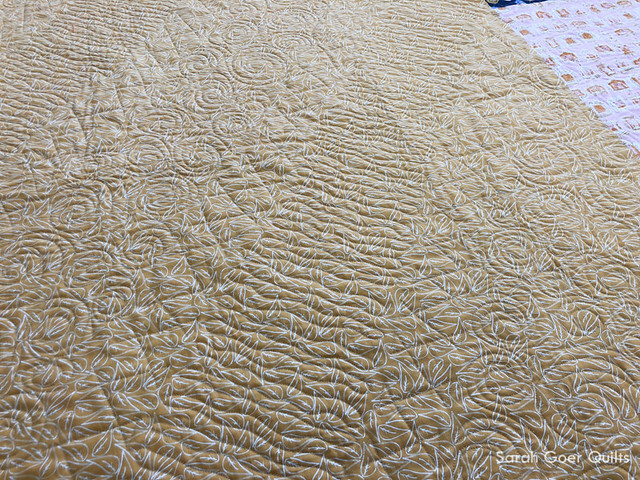 And well done on the longarm quilting, too! Thank you for participating in the FAL, on behalf of the 2018 FAL hosts!